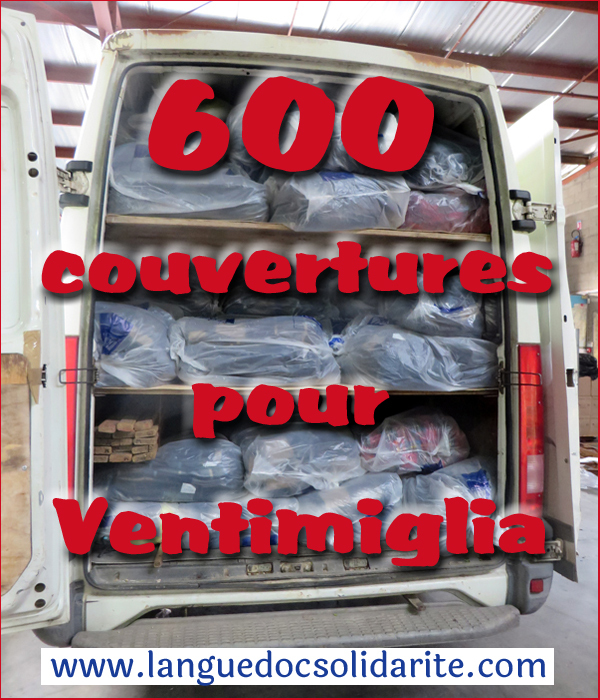 LSR has just shipped off 600 donated blankets to be used by refugees without shelter at the French border in Ventimiglia. This was accomplished very quickly (36 hours) thanks to our large and growing network of volunteers engaged in creating a more humane life for refugees. Danica (in Paris) introduced me (Gary) to Jay (logistics magician in Ventimiglia) who had an urgent need for blankets for several hundred refugees being expelled from even their temporary shelter under the bridges there. Contact was made with a previous donor of large numbers of blankets (who prefers anonymity). From there it was a matter of negotiating via various electronic media how and when the transfer could be made via a donated van located by Jay. The result was that Gulhem (van driver) showed up in Servian this morning with an empty 13 cu meter Iveco van, which a small group of LSR volunteers then helped to stuff full with clean, packaged, warm blankets to send off. By Saturday evening they should be doing their work making people sleeping rough a little more comfortable. Many thanks to Danica, Jay, Gulhen, Joel, Wendela, Brigid, Philip and Graeme who all played a role in getting this done. When we all do a little a lot can be accomplished.